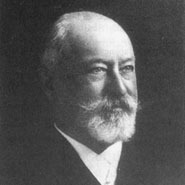 Jacob Schiff emigrated from Germany to the United States in 1865 and two decades later became head of the banking firm Kuhn, Loeb and & Company. Schiff's success on Wall Street helped him to finance, among other things, the Japanese military efforts against Czarist Russia. He served as director of several important corporations, including Wells Fargo & Company and the Union Pacific Railroad. A Jewish leader and philanthropist, he supported relief efforts for victims of pogroms in Russia as well as a constellation of institutions and organizations dedicated to helping Jewish immigrants in America's overcrowded cities. He was among the founders of the American Jewish Committee, the Jewish Theological Seminary, and Hebrew Union College.